The full-size trucks which feature heavy-duty status have been primarily designed for towing and hauling the heaviest loads but modern trends have made these machines more refined and equipped for everyday ride as well. The brands offer these models in several ranks according to their hauling capabilities. The best offers are Ford’s Super Duty series, Chevy’s heavy-duty versions and Ram’s models with heavy-duty status. The Ram 3500 is positioned above the 2500 and 1500 models in brand’s lineup in terms of size and loading capabilities and among the equivalents from the rival brands it is one of the best solutions thanks to good ride quality, top-notch interiors and impressive pulling and hauling capabilities. As we know, Ford redesigned its Super Duty models for the 2017 model year but so far 2017 Ram 3500 hasn’t been reported for serious upgrades. Ram presented the 2017 Power Wagon and 4×4 off-road version of 2500 model but hasn’t announced something new for upcoming Ram 3500. This model, however, has been upgraded in last model years. In 2014 it added a new 6.4 liter V-8 engine with the rear air suspension and new base Tradesman trim. The 2015 model has brought minor upgrades while the last model year has introduced refreshed exterior for the top Laramie Limited trim and more importantly has increased torque figures of the diesel engine to 900 pound-feet. For the performance front, the new 2017 Ram 3500 will be armed with three engine options including gasoline and diesel units. The base variant will be a 5.7 liter V-8 engine which can produce around 383 hp and 400 pound-feet of torque. This engine works in combination with a six-speed auto transmission. An alternative will be a 6.4 liter V-8 which rises power output to around 410 hp while torque figures hit 429 lb-ft. It will also be combined with six-speed automatic gearbox. The most capable for towing and hauling will be models equipped with a 6.7 liter turbodiesel inline six Cummins engine that will be available in several tunings. With manual transmission this engine will produce around 350 hp and 660 lb-ft of torque. This engine can also be combined with two six-speed automatic transmissions and one will be capable for 370 hp and torque of 800 lb-ft. When equipped with heavy-duty Aisin transmission it will produce 385 hp and impressive 900 lb-ft of torque. All Ram 3500 models will be available with either rear-wheel or all-wheel drive. Manually controlled transfer case will be only on the base Tradesman models with option for electronically controlled transfer case that will be standard on all other versions. The towing and hauling capacities are expected to stay close to the current numbers. So, the configuration with base engine will allow to haul up to 4, 500 pounds and max towing around 13, 900 pounds. These numbers will be around 7, 400 pounds for hauling and 16, 500 pounds for towing in case of a 6.4 liter V-8 engine. The winner in this area will be diesel powered models with Aisin automatic transmission which will handle max towing around 31, 200 pounds and will be able to haul around 6, 600 pounds. The exterior styling of the new 2017 Ram 3500 won’t experience some drastic modifications and only minor refreshments might be introduced. The models will feature robust appearance adorned with Ram’s signature features. Different trims will include unique chrome details and grille designs. The models in base trims will ride on the 17-inch wheels while 18- and 20-inchers will also be available in higher grade models. Interior layout of this model will be similar as on the light-duty 1500 version. Its cabin will surely be one of the nicest in its class. The high-quality finishes and soft-touch surfaces will be adorned with contrasting stitching and abundant metallic accents in higher trims. There will also be plenty of space for adult passengers in comfortable seats and Mega Cab models will also offer expanded legroom for people in the rear seating row. Clever compartments and pockets will also provide space for goodies. Another value of this model will be its functionally and neatly arranged dashboard. Controls are large and easy to recognize and use and things will be even better on model with a 8.4 –inch touchscreens. The model will also offer the options for different camera views which will provide cargo area and rearview to be displayed on center screen and on small screen which is the part of the rearview mirror. The new Ram 3500 will be offered in three cab styles. There will be regular models with two doors while crew cab and mega cab models will be with four-doors. The model will also be available with two bed lengths including longer 8 foot and 6 foot 4 inches beds. The regular cab versions will only come with longer beds and four-door models will be available with both bed lengths. Each body style can also be configured with either single rear wheel or dual-rear-wheels. The company won’t probably change available trims and model will be available in base Tradesman, SLT, Big Horn/Lone Star, Laramie, Laramie Longhorn and Limited trims. All trims will be available on four-door models while Regular Cab models will be available with first two trims. The entry-level models with Tradesman trim will come with 17- or 18-inch wheels, vinyl upholstery, automatic headlights, six-speakers, information display, a limited rear slip differential and so on. On the SLT models will be available chrome exterior trim, cloth upholstery, heated and power mirrors, keyless entry, a 5-inch touchscreen, Bluetooth, satellite radio, etc. The next Big Horn/Lone Star trim will add 18-inch alloy wheels, fog lights, premium cloth interior, 10-way power adjustable front seats, leather-trimmed steering wheel and so on. If you want leather upholstery, an 8.4 inch touchscreen infotainment system, dual zone climate control, heated and ventilated front seats, and more it will be available on Laramie models. On the Laramie Longhorn Rams will also be upgraded leather upholstery, navigation, heated rear seats, power adjustable pedals, unique grille design and so on. The top Laramie Limited versions will include 20-inch wheels unique chrome exterior trim, automatic high beams, unique black upholstery, etc. Other options that will be available are also cargo view camera, rear air-leveling suspension, off-road tires and so on. For the safety, models will include stability and traction control, antilock disc brakes, tire-pressure monitoring, rearview camera, cargo view camera, parking sensors, etc. 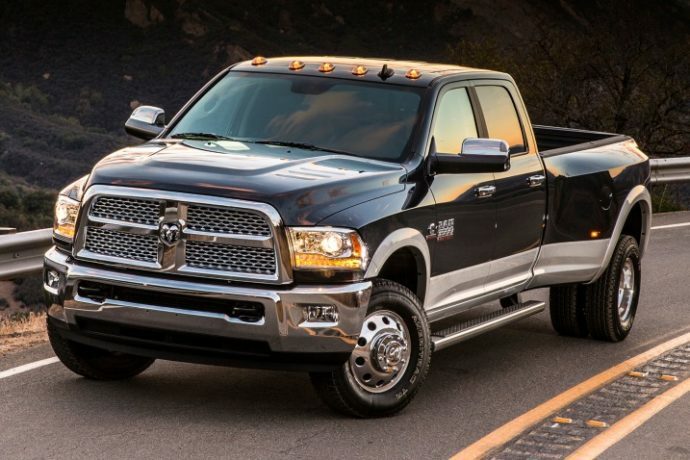 The new 2017 Ram 3500 release date hasn’t been officially announced. However, this model should arrive by the end of this year. Pricing should remain close to the current model price range.